Bracketed with the top most Manufacturers, Exporters and Suppliers in Delhi, we consider it as our responsibility to offer quality assured Silica Gel. Its accuracy of composition, superb efficacy, and longer shelf life have fetched so many buyers from all over the globe. To meet the immediate demands of the buyers, we maintain a huge stock in our spacious warehouse. Silica gel is a granular, vitreous, porous form of silicon dioxide made synthetically from sodium silicate. 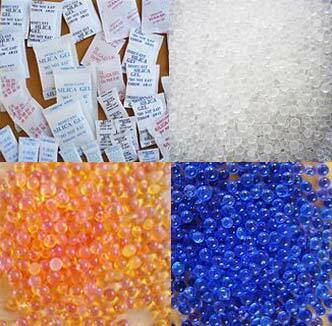 Silica gel is tough and hard; it is more solid than common household gels like gelatin or agar. It is a naturally occurring mineral that is purified and processed into either granular or beaded form. As a desiccant, it has an average pore size of 2.4 nanometers and has a strong affinity for water molecules. Silica gel is most commonly encountered in everyday life as beads in a small (typically 2 x 3 cm) paper packet. In this form, it is used as a desiccant to control local humidity to avoid spoilage or degradation of some goods. Because silica gel can have added chemical indicators (see below) and adsorbs moisture very well, silica gel packets usually bear warnings for the user not to eat the contents. PH – 3.5 to 8. Packing– 25 / 50 kgs M S drum (Smaller packing available).